Everyone visits the corner cafe. This one is on the Rue Cler, near our apartment and it’s a great spot. The coffee is better down the street, but the Cafe du Marche is a more interesting location. 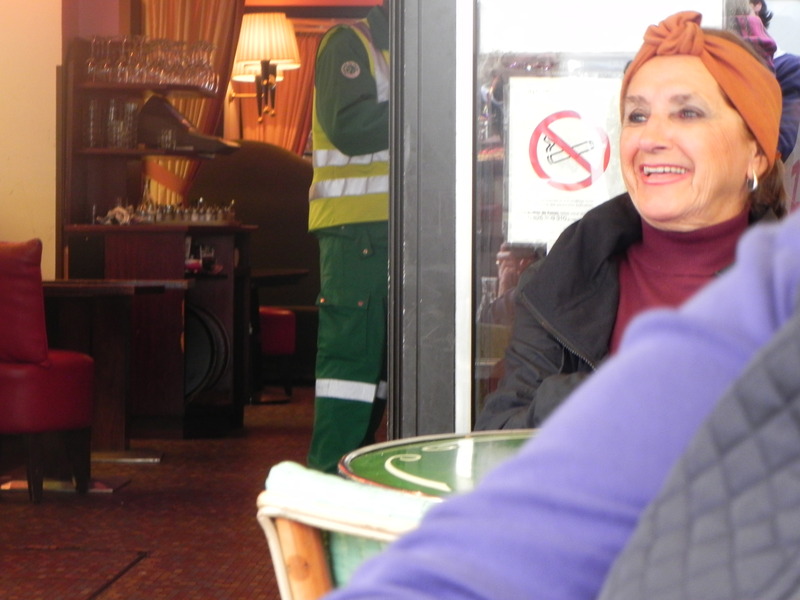 I noticed some kind, generous nieces taking their ageing aunt out for a p’tite cafe. I mention this in case any nieces or nephews I know wonder what ageing aunts like to do on a Saturday in Paris. 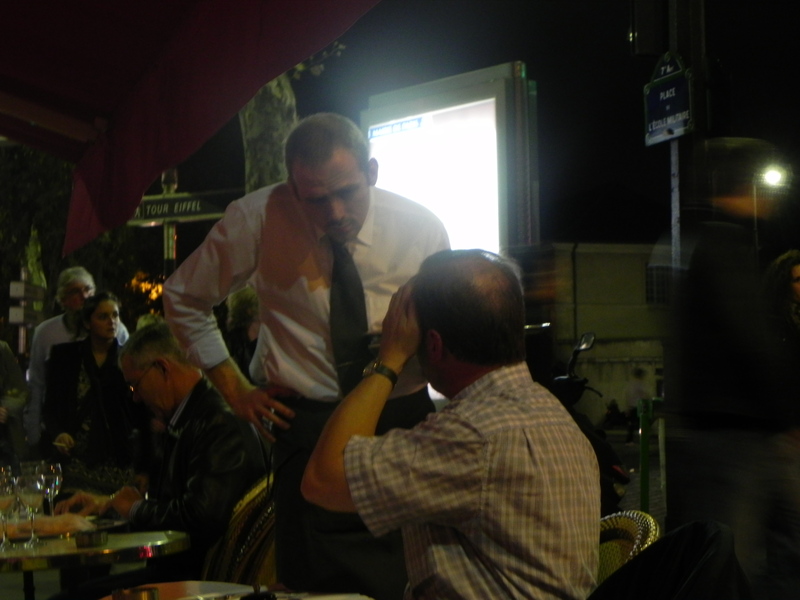 In the evening, the preferred post for people-watching is the La Terrasse. The location near the Ecole Militaire metro stop means non-stop traffic. 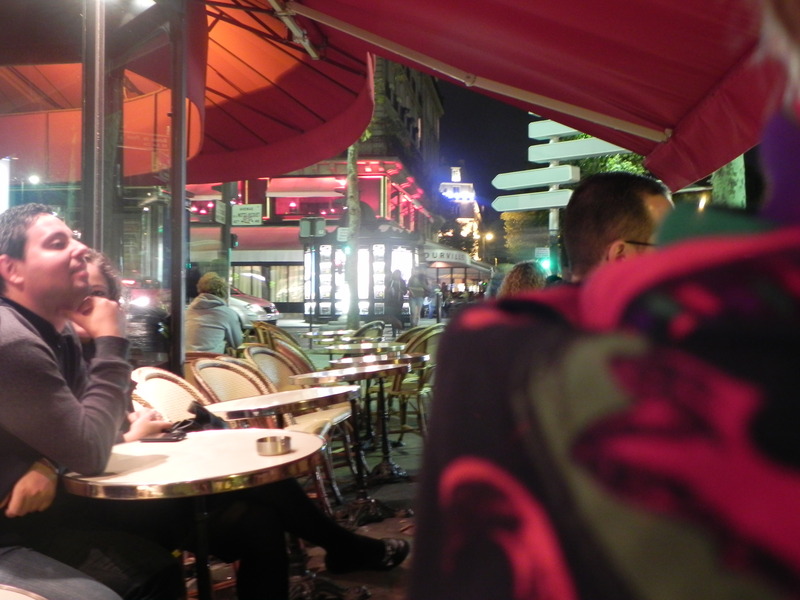 A glass of port or a Viennese coffee buys you a table for as long as you care to linger. And the waiters are nice. I want one of those black waiter’s vests because I like the pockets. It means asking a waiter where to get one. Do I have the nerve and the verbs to do it? Why isn't he wearing a black vest? Tonights fashion report; girls are wearing black tights under short dresses, knee-high boots and retro Carnaby Street peaked caps. This entry was posted on October 2, 2010 at 4:25 pm and is filed under Uncategorized. You can follow any responses to this entry through the RSS 2.0 feed. You can leave a response, or trackback from your own site. I think we have consumed more alcohol and more food than in seven Colucci evenings. Is this the bistro we ate at on our last night when we were here last? Clare, yes it is! Remember the bearnaise sauce and the baba au rhum? We always eat here on the last night of our visit. I have no idea how that started. I am loving this! Hating you, but loving this! 🙂 The pictures are great! I am so glad you’re having fun! Toby is looking out the window trying to see Paris and the cafe life. He sees Sam, Sam sees a chipmunk… watch out! That’s the action in this cafe..going downstairs for some wine ASAP for Sat. nite at home. You were meant to be a travel blogger! Love this & so glad you are having a wonderful time!!!! I could do multiple posts on cafes. Lingering over a glass of wine and observing are my past-times. And remember – wine is cheaper than a diet coke.